POTUS called out “Tonight Show” host over 2016 interview backlash: “Be a man Jimmy! 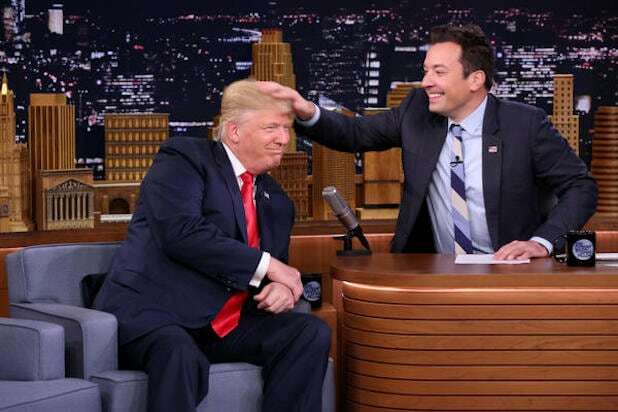 President Donald Trump on Sunday called out “Tonight Show” host Jimmy Fallon for expressing regrets about his September 2016 interview in which the comic famously tussled the then-candidate’s hair. Late Sunday, Fallon responded by promising to make a donation — in Trump’s name — to Refugee and Immigrant Center for Education and Legal Services (RAICES), a charity providing free and low-cost legal services to underserved immigrant children, families and refugees in Central and South Texas. The nonprofit has gained visibility since the Trump administration’s zero-tolerance policy for immigrants and asylum seekers arriving at the Southern border. In a Hollywood Reporter podcast published earlier this month, Fallon talked about the blowback he received for the election-season interview. “I did not do it to ‘normalize’ him or to say I believe in his political beliefs or any of that stuff,” said the comic, who lost a significant chunk of his audience after Trump won the election. He consistently trails CBS’ Stephen Colbert in total viewers now — and was even snubbed for an Emmy nomination last year in the variety series category.